Chelsea manager Maurizio Sarri has hailed the mentality of his team following the stunning 2-0 Premier League win over Manchester City on Saturday afternoon. The Blues had come into the match as underdogs despite the home advantage, given they had recently suffered a shock 2-1 defeat at the hands of Wolverhampton Wanderers. The west Londoners made a shaky start to the game where they were guilty of losing possession of the ball on multiple occasions but they still managed to gain advantage before half time with N'Golo Kante opening the scoring with a belter of a strike. Thereafter, the Capital outfit appeared to gain confidence which contributed towards several other opportunities on goal and they eventually sealed the game through David Luiz's headed effort which found the net in the 78th minute. 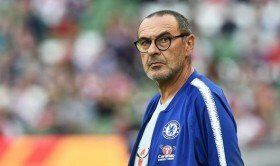 Speaking after the game, Sarri was appreciative of the efforts displayed by his players after going through a tough period of matches in the Premier League. "I am very happy with the win because it is not very easy to win against Manchester City or Pep Guardiola. I am happy with the mentality of the team in this match," he told BT Sport. The victory sees the Blues occupy the fourth position in the standings ahead of arch-rivals Arsenal on goal difference. Chelsea's next league game comes against Brighton & Hove Albion.